Customize your project portfolio by editing or creating project status + project health combinations (Plus or higher plans only). Project status is the top-level description that indicates whether the project is active, on hold, (planned for the) future, or closed. Project health is a subset of project status. For example, a future project could have a health of approved, not approved, speculative, etc. Project status and project health do not automatically change when the circumstances of your project change. They must be manually changed by a user. Go to Settings > Projects. 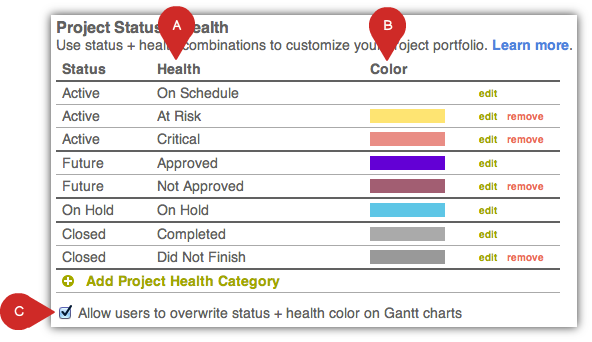 For each project status, you can create as many health categories (A) as you'd like, as well as assign a color (B). The colors are displayed on Gantt charts, Projects tab, and the Project 360 page. You have the option to allow users to overwrite the assigned Gantt chart color (C). Allowing users to overwrite the color is limited to just the Gantt chart color. 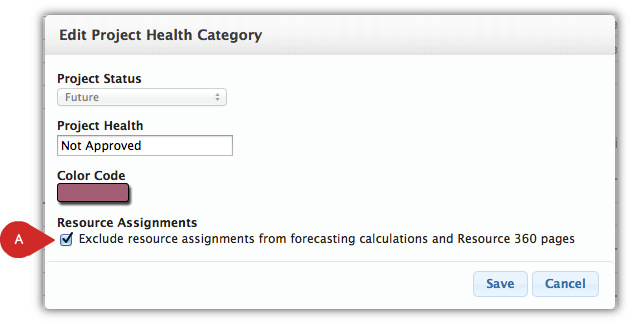 Set status + health combination to "fly under the radar" by excluding resource assignments from resource forecasting calculations and the Resource 360 page (A). This may be useful if you are constructing a project that has not yet been approved. Add the Previous Health column group on the Projects Tab to track the date of the last change, as well as number of days since the change. Basecamp (new) only supports Active or Archived (closed). Roadmap statuses of On Hold or Future map to Active. Basecamp Classic supports Active, On Hold, and Archived (closed). Future projects in Roadmap map to Active.